Cambodia, a country in Southeast Asia in the southern part of Indochina, covers an area of 181,035 square kilometers and has a population of 13,124764 million (2003 est.). 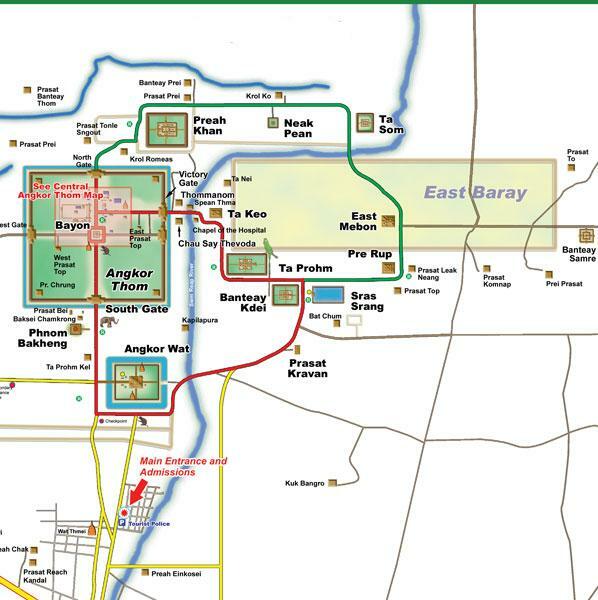 The country's shape is an almost-square polygon, with Kampong Thom Province as its central point. The country extends 440 kilometers from north to south and 560 kilometers from west to east. 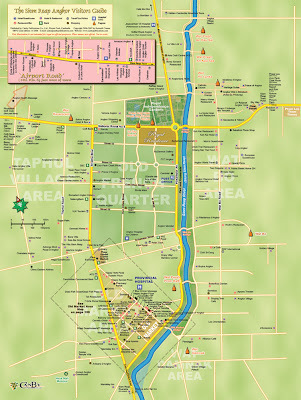 This shape makes Cambodia easy for tourists to navigate and poses no difficulties for the development of tourism. Among the 10 member countries of the Association of Southeast Asian Nations (ASEAN), Cambodia ranks eight in land size and seventh in population. Its geographical location makes Cambodia an easily accessible ecotourism destination for travelers in neighboring countries and other parts of the world. The country is situated geographically between the 10th and 15th parallels north latitude and the 102nd and 108th parallels east latitude. 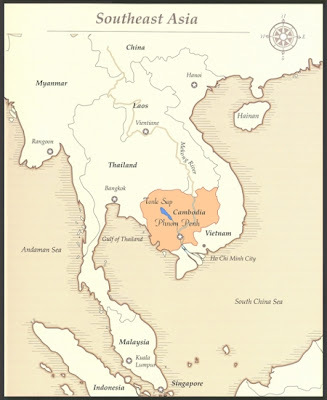 The borders of Cambodia encompass 2,600 kilometers of which five-sixths are land and one-sixth is coastal border. 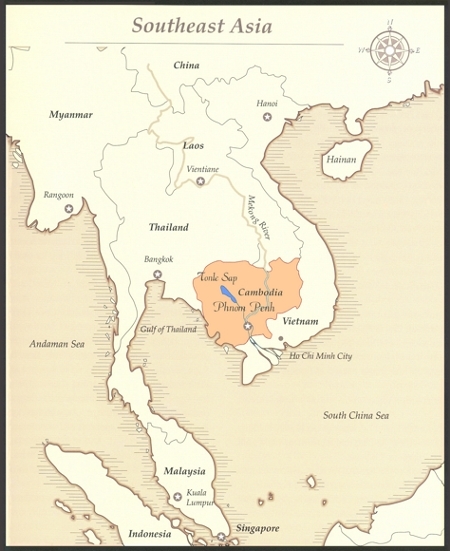 The Kingdom of Cambodia is bounded on the northeast by the people's Democratic Republic of Laos, on the east and southeast by the Socialist Republic of Vietnam, and on the west and northwest by the Kingdom of Thailand. The coastal boundary of Cambodia is 440 kilometers with medium depth tropical sea, rich in aquatic creatures that are good for aquatic business. In addition, there are beautiful, uninhabited islands, virgin beaches, white sand and fresh air, which are also good for tourism. Cambodia's land surface is deep and plain at the middle since it is surrounded by mountain and plateaus. In the southwest lies the coastal area. This area covers 25,069 square kilometers. The total population of the plain area is 5,898,305 or about 51.6 percent of the entire population, and the population density is 235 persons per square kilometer, according to the 1998 census. This area consists of 63 districts, 700 communes and 6,414 villages. 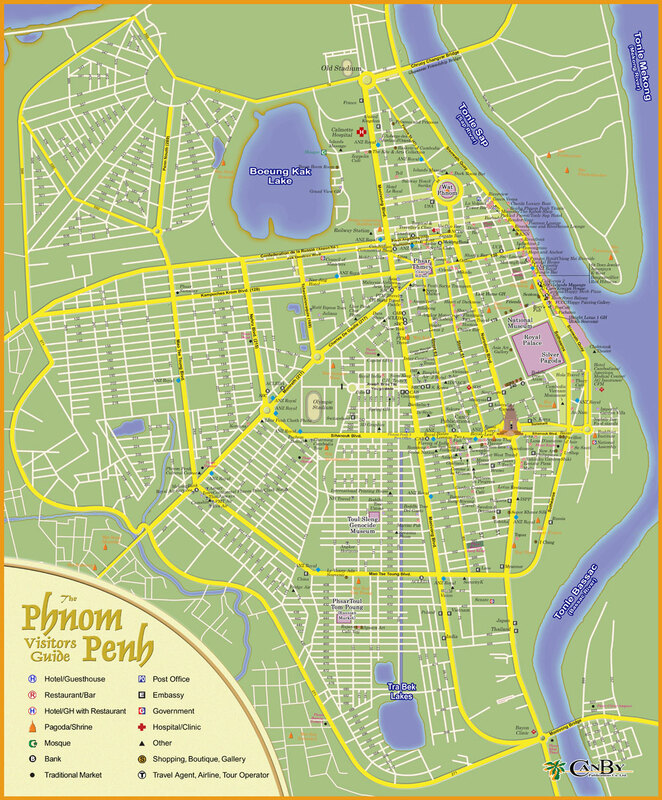 The capital city of Phnom Penh, as well as Kandal, Kampong Cham, Svay Rieng, Prey Veng and Takeo provinces are located in this area. The plain area is the most crowded inhabited by many races of people including Khmer, Chinese, Vietnamese, Cham, Thai, Lao and Westerners. Minority groups including Kuoy and Steang also live in the Krek and Memut district in Kompong Cham province. This area covers 67,668 square kilometers. the total population of the surrounding Great Lake Tonle sap area is 3,505,448 or about 30.7 percent of the entire population of Cambodia, and the population density is 57 persons per square kilometer, according to the 1998 census. It consists of 60 districts, 488 communes and 4,041 villages. 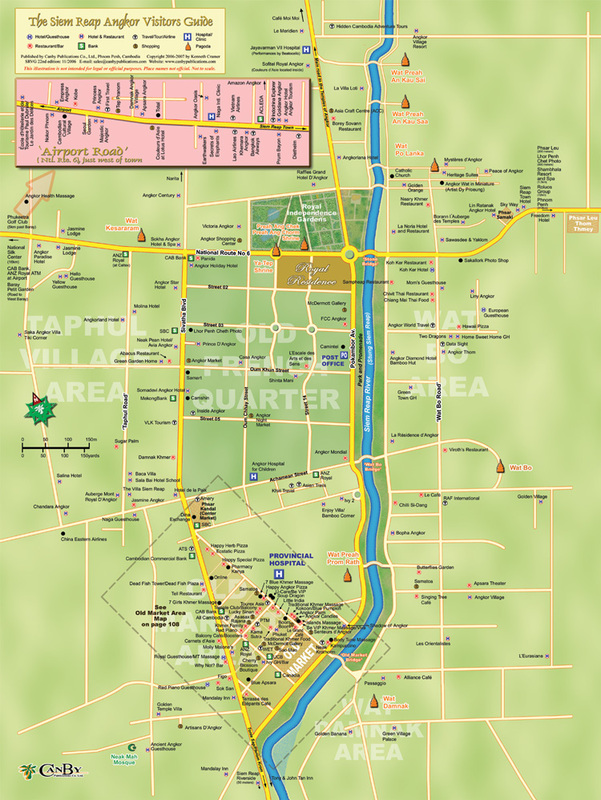 The area includes Kampong Thom, Siem Reap, Banteay Meanchey, Battambang, Pursat, Kampong Chhnang and Oddar Meanchey provinces and Pailin city. The surrounding Tonle Sap area is inhabited by many races of people, including Khmer, Chinese, Vietnamese and Cham. In addition, there are a number of minority hill tribes such as Sa Och, Steang and Samre, who inhabit the mountainous area. Cambodia's coastal area covers 17,237 square kilometers. The total population living in the coastal area is about 845,000 people, or about 49 persons per square kilometer, according to the 1998 census. It consists of 21 districts, 152 communes and 705 villages. 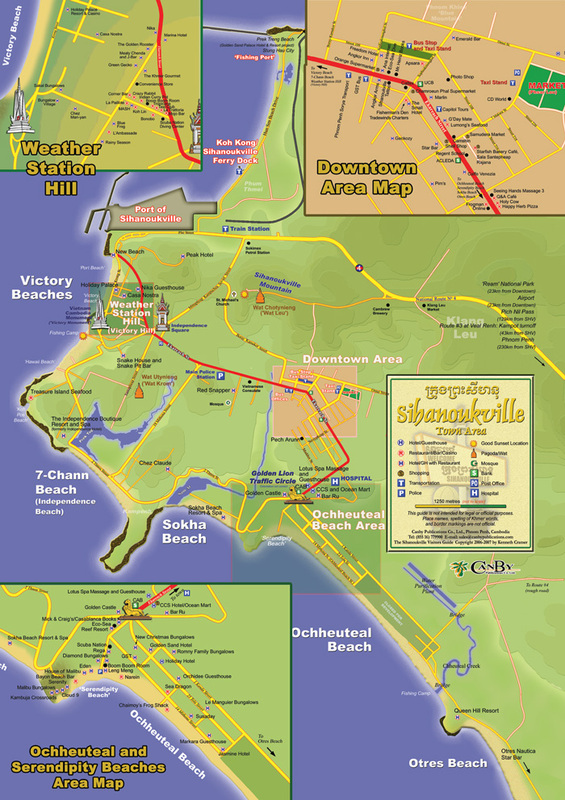 The area includes Sihanouk Ville, Kampot and Koh Kong provinces, and Kep city. All lie along Cambodia's southwestern coast, which is 440 kilometers long. 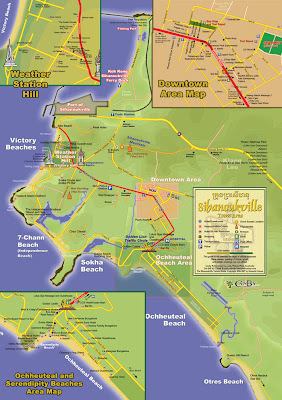 Sihanouk Ville is the mid point of the coastal area. 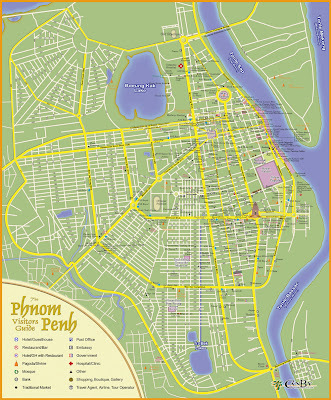 It is 232 kilometers from Phnom Penh. About 80 percent of the population of the coastal area is Khmer, although Cham, Vietnamese, Chinese, Thai and ethnic minorities such Sa Och also live here. Most of people living along the coast have a good life. They earn their living by farming and fishing. The topography of Cambodia's coastal area is mountainous, plateau, plain, coast, seaside and gulf. There is much sand in this area. Palm oil, rubber, coconuts, pepper, durian and other crops can be grown in this area. It is also rich in varieties of mangrove. The total length of the Cambodian coastal area has been disputed over the year. The generally accepted length is 440 kilometers, although a 1997 survey by the DANIDA organization set the length at 435 kilometers, while the Oil Authority in 1973 determined the coast to be 450 kilometers long. In Cambodian schools, however, the 440 kilometer figure is used. Cambodia's gulf, which divides the country from the Malacca subcontinent, is not very deep, averaging only 50 meters. The maximum depth is 81 meters. The bottom is plain. There are 60 islands in Cambodia's coastal waters. They include 23 in Koh Kong province, 2 in Kampot province, 22 in Sihanouk Ville and 13 in Kep city. This area covers 68,061 square kilometers. The total population of mountainous and plateau region is 1,189,042 or about 10.3 percent of the country's entire population, and the population density is 17 persons per square kilometer, according to the 1998 census. It consists of 39 districts, 283 communes and 2,246 villages. The area includes Kampong Speu, Kratie, Stung Treng, Preah Vihear, Rattanakiri, and Mondulkiri provinces. The mountainous and plateau region is inhabited by many races of people, including Khmer, Chinese, Vietnamese, Laotian, and Thai. In addition, there are 18 minority groups. They include Pnong, Steang, KraolRo Oung, Tumpun, Tmuon, Bruv, Smil, Kuoy, Ar Norng, Charay, Kreung, Roder, Kha, Sa Och, Kachok, Kavet and Lun. Of these minority groups, the Pnong are the largest, comprising about 45 percent of the minority population. The climate distinguished by four major seasons. The most pleasant is the cool-dry season from November to February during which temperatures are cooler (average 20-28º C.). The hot-dry season lasts from March to May (average 30-35º C.). From June to August is the rainy season, during which temperatures are relatively cool (average 22-30º C.). And from September to October is the cool-wet season (average 25-30º C.). At this time of year it rarely rains in the morning: most precipitation comes in the afternoon, and even then, only sporadically. Rainfall varies considerably from area to area. Whereas the seaward slopes of the south-west highlands (Kompong Som and Kampot provinces) receive more than 5,000 mm of rain annually, the central lowlands average only about 1,400 mm.